Simple jquery popup which generally use to show or to perform some operations as supplementary operations. You will get the popup as like below. All the Cyan color is mainly for Jquery popup code. When you are clicking to the Age click here it will open the popup near to the link and to make position of the JQuery popup you need to change into CSS. You can change the position of popup from the margin-top positions. 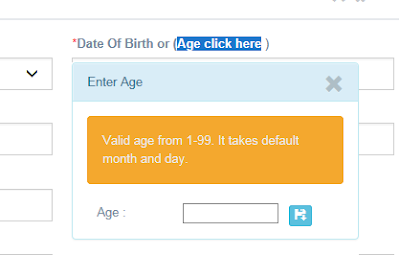 It is performing the operation to get the date of birth by giving the age in Jquery. It’s just generic way to get the default date of birth. Jquery code for Date of birth by age.